You might be the greatest locksmith around, but that doesn’t mean much if nobody’s actually heard of you. Fortunately, the internet is kind of a big thing now, and it can help you immensely when it comes to spreading your brand and increasing your customer base. How, you ask? Just read on! Let’s face it – nobody uses the telephone anymore and potential customers are going to look online to find a locksmith when they need one. So if you want them to find you, you need to have an online presence – and that means a website. Your main company website is basically a first impression online. It’s where people end up when they google you, so you’ll want to make sure you stuff it with everything that might convince them to hire you. This is where you can fully break down your services, equipment and qualifications, giving prospective clients all the information they need to make an informed decision. It also allows you to tell the story of your business, which helps you build a relationship with potential clients and makes them more likely to book your services. Having a website gives your business a sense of credibility, as people tend to feel like companies are more legitimate and well-established if they have a high-quality online presence. That sense of credibility could be the difference between someone making a booking or not. Having a website also lets you learn a lot about your customer base. Who is using your services? Are they male or female? Young or old? How are they finding your site? You can learn all of this – plus a lot more – using analytics, and then you can adapt your offerings to match. For example, if you are getting a lot of hits from middle-aged working professionals, you could emphasise that after-hours and weekend services are available. And if analytics shows that all of your website hits are coming directly from Google searches, then you may consider paying more attention to your Facebook page – generating content and linking back to your site to get another stream of potential clients from there. Melbourne’s Toplock has a great website, greeting you instantly with two smiling employees on the homepage. Friendly faces never hurt, and neither does placing your main selling point (24/7 emergency service) right at the top of the page. If anyone desperately needs a locksmith, that’s the first thing they’ll see and will set them well on the path to booking. The phone number is prominent too, and the fast free quote form adds an even easier way of getting in touch with them. It’s all about the good user experience, and taking as much hassle out of the booking process as possible. The site contains links to all the company’s reviews on Womo, True Local, Facebook and Google+, so anyone can instantly see what their fellow customers have to say. This just oozes confidence and trustworthiness, proving that the business is proud of its work and has nothing to hide. The blog and links to media spots the company’s done further their image as leading professionals, and linking to their Facebook, Twitter, YouTube and LinkedIn pages makes it a breeze for customers to contact them any which way. While we can’t comment on all business directories, we know that True Local is a very handy little place for customers to review your business and encourage others to give you a call. After all, nothing is going to motivate a potential customer to book your services better than seeing a page glowing accounts of your skills and workmanship. That’s the kind of reputation you just can’t buy. Business directories allow you to list your suburbs and services, saving people a lot of time in deciding if your company can meet their requirements, plus with True Local, you can further hook them in with special offers, accreditations, and whatever else sets you apart from the rest. Basically, your True Local listing can act like a website if you don’t have one, and you can even customise it through the business centre. True Local pages also come with great SEO benefits. Google recognises that we are a content-rich site and a reputable source, which means we rank highly in search results. This increases the chances that your individual business page will be near the top of the list in search results too. Plus, True Local has all the tech know-how to optimise site speed and SEO standing, so we’re always prepared if Google makes any changes. That’s one less thing for you to worry about. There are other advantages for local companies, too. Businesses that list on True Local have the opportunity to attend online marketing seminars, be involved in marketing campaigns, or be featured on our social media pages, blog articles and email newsletters. True Local also curates weekly content with tips, tricks and advice to get you ahead of the game. So if you’ve ever thought about online marketing but didn’t know where to start, True Local could be the perfect online platform for your business. 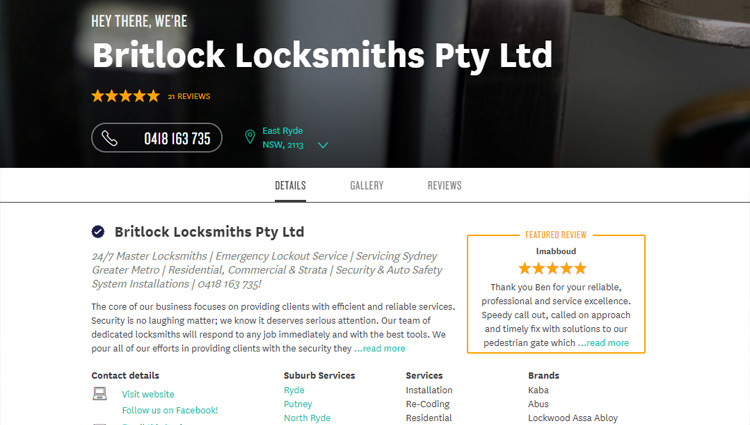 Britlock Locksmiths is an excellent example of a quality True Local page. They respond personally to customer reviews, proving they care what people think and encouraging more people to write them. The complete list of suburbs and services ensures that nobody’s time is wasted, and that only customers in the right areas with the right problems will get in touch. The page also links back to the company’s website and Facebook page, which lets people connect with them there. The introduction is well worth mentioning, it’s clearly written and laid out in small, easy-to-digest sections (commercial/residential/automotive). This is very important, as it prevents people from immediately clicking away when they can’t decipher what exactly you do. Lastly, the photo gallery is filled with tangible evidence of the work they do and how well they do it, plus a few nice shots of the staff to give a trustworthy, human face to the business. If we had a dollar for every person on Facebook, we’d be billionaires. Literally. It’s got an absolutely massive user base, which means tons of potential customers simply waiting for you to reach them. Facebook lets you talk to people directly through comments and messaging, and it’s a great communication platform for mobile locksmiths with no fixed location. Plus, it allows you to link back to your website or True Local listing – leading to more hits there and therefore a higher Google ranking. When it comes to what content you should be putting on your Facebook page, just remember: you want to give people a reason to follow your page. Therefore, your posts should be relevant and engaging. Share a variety of cool stuff, such as high-quality pictures of jobs you’re working on, interesting news articles related to the locksmithing industry, and even funny or personal posts that catch people’s attention and break up the usual sales messaging. And always be sure to promote any special deals you’re having. Even if it’s just 10% off, people want to hear about ways they can save. If your content is good, there’s a chance it could be shared by your followers to their own friends, promoting your brand and maximising exposure. Just remember to keep your posts short and snappy – under 100 characters is best. Everyone is short on time these days, and nobody wants to read a great wall of text while they’re scrolling through their feed. 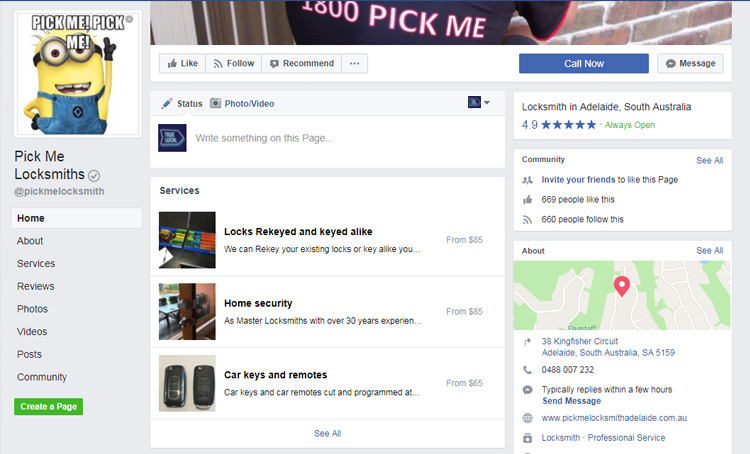 To see Facebook done right, just head over to Pick Me Locksmiths. They’re very responsive to messages and comments, showing they care about creating a community and value what their followers have to say. They strike an excellent balance between the sales and personal posts we mentioned, mixing things up and keeping the content fresh. They upload videos as well as photos, which comes across as very professional, and generally keep their posts regular but not too frequent – about once a week. These guys also like to share useful security tips, which is the kind of thing that portrays them as genuine experts in their field. Linking back to their main website means more traffic there, and they even list their prices upfront in the name of honesty and convenience. Looking for the key to online success for your business? Browse through our other handy business tips.